Home / Latest News / fall's hottest hair trend @ nuBest salon and spa! fall's hottest hair trend @ nuBest salon and spa! this fall's hottest hair trend is, quite literally, taking off with flying colors -- and is now available at nuBest salon and spa. colored hair extensions in variegated vivid hues are becoming increasingly popular among the fashion pack and the celebrity set. as well as being seen on a number of "dancing with the stars" contestants, singers katy perry and jordin sparks have recently been spotted with streaks of purple, blue, and fuchsia, while ashley olsen, lauren conrad, kate bosworth and rachel mcadams are among the trend's earliest adopters. on the fall runways, the look was executed at prabal gurung, fendi, theyskens' theory, yohji yamamoto and tracy reese. the trend shows no signs of slowing down for next season, as orange and rose gold streaks popped up at peter som's spring 2012 presentation last month at new york fashion week. unlike the feather hair extension fad that became ubiquitous over the summer, which lend themselves to a specifically bohemian aesthetic, colored hair extensions are an easy way to add a little edge to your hair, regardless of your personal style. nuBest salon and spa currently offers extensions that are secured to the hair with a metal clamp, and can stay in for up to several months if you so choose. available in an array of eye-catching colors, from hot pink and turquoise to royal blue and violet, these extensions offer the best of both worlds; made from real hair, they can be washed, shampooed and styled as usual, and can be removed at your discretion, without the commitment of chemically altering your hair with temporary dyes. put a singular streak on one side of your part for a subtle shot of color, or layer several complementary colors to make a bolder statement. 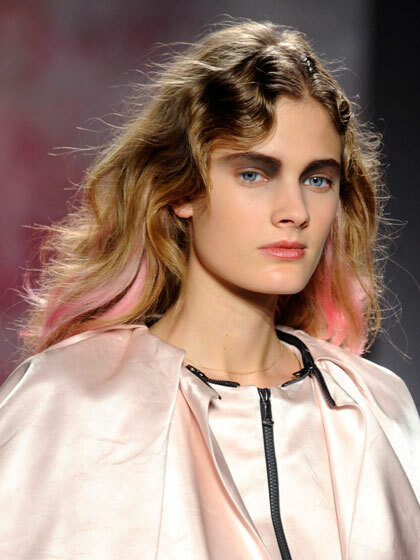 what do you think of the colored hair extension trend? which color would you choose?